Developing more cartridges of ammunition than any other producer in the world, Remington is a leading seller and developer of shotguns, rifles and ammunition. 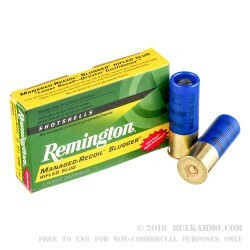 Remington buckshot gives a lot of bang for your buck! Beginning with Eliphalet Remington’s first rifle in 1816, Remington has charged into the 21st century with their state of the art research and development team at the Rock. 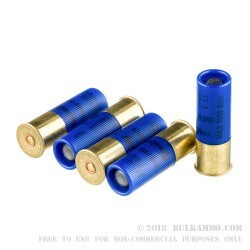 These Remington Managed Recoil 12 gauge Slugger shotgun shells come equipped with a one ounce rifled slug in a 2 ¾” shell casing, and are capable of a muzzle velocity of 1200 fps. The Managed Recoil line of Slugger ammunition from Remington offers 45% less felt recoil than regular sluggers, offering faster second shot target acquisition and less hurt on the shoulder. 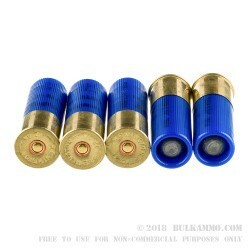 Effective up to 80 yards, these shells can handle most shotgun deer hunting distances. 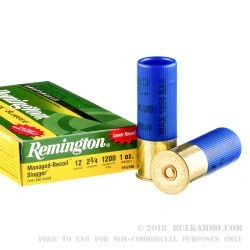 If you’re looking for a 12 gauge that won’t bruise your wallet or your shoulder, Remington’s Managed Recoil Slugger rifle slugs are a great choice. Five shells come in each box.